CINCINNATI, Ohio -- The 96-year-old retired chest surgeon credited with developing the namesake Heimlich maneuver has used it to save a woman choking on food at his senior living center. The dining room maitre d', Perry Gaines, told The Cincinnati Enquirer that Heimlich dislodged a piece of hamburger from the woman's airway and she quickly recovered. "As soon as I did the Heimlich maneuver, a piece of meat with a bone in it immediately popped out," he said. Choking victim Patty Ris said Friday that she couldn't breathe and Heimlich rushed over to stand her up and dislodge the food. "I definitely would have died right then and there," said Ris, who said she felt fine Friday and had no after-effects. "There was no doubt about it." Ris said that after she regained her breath Heimlich explained to her what he had done. She told him afterward: "God put me in this seat next to you." Heimlich said in interviews Friday that it was the first time he'd used his maneuver, and his son Phil Heimlich said he believed that was accurate. But the doctor said in at least one previous account, a 2003 interview he did with BBC News Online, that he had applied his emergency technique three years earlier. Heimlich has said he developed the maneuver after reading accounts of people choking in restaurants, with many of them dying. Through the years, he appeared on radio and television shows including "Tonight Show Starring Johnny Carson" to discuss and demonstrate the technique. 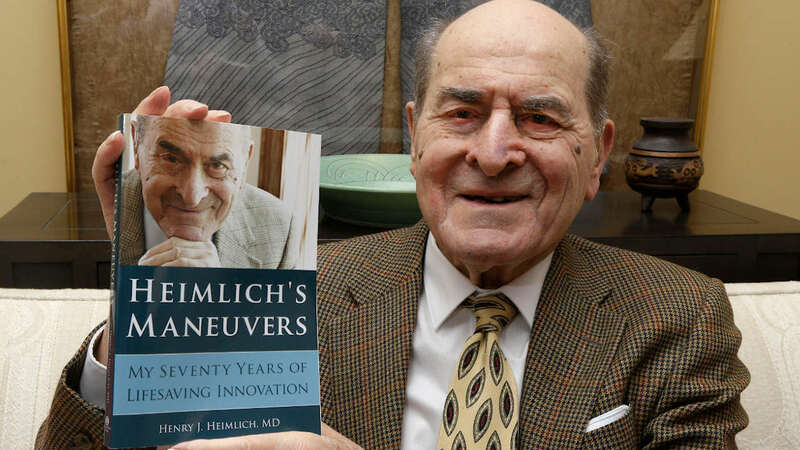 Heimlich's views on how and when the maneuver should be used have put him at odds with some people in the health field.